The various ferries of Lake Michigan offer more than just a means of transportation. The trip across the water to your destination can be a wonderful experience! Sometimes, the ship can take you to places you cannot reach by land. In other instances, the cruise across the water can provide a short-cut to your destination, saving you hours of driving time. Here, we've compiled some of the more popular ferries which take you out on the water of Northern Lake Michigan. The most relaxing cruise across Lake Michigan is on the S.S. Badger from Ludington, Michigan to Manitowoc, Wisconsin. Both destinations are near the halfway point along the Lake Michigan shoreline, so the S.S. Badger makes an excellent short-cut for travelers on the northern regions of the Lake Michigan Circle Tour. This historic ship provides passengers with a fun cruise featuring many modern cruise-ship amenities. 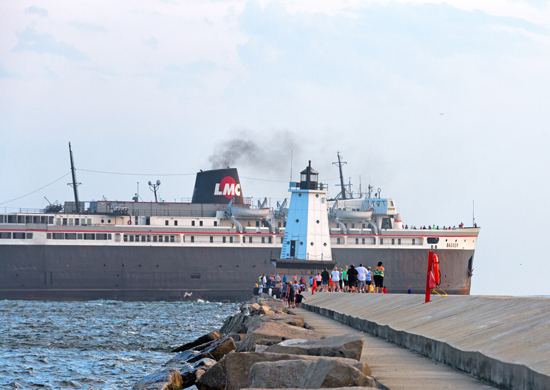 The four-hour, 60-mile cruise between Ludington and Manitowoc has all the comforts of home and more. The 410' S.S. Badger carries up to 620 passengers and 180 cars, tour buses, RVs, and semi-trucks. There are lots of entertaining activities aboard the S.S. Badger as it crosses Lake Michigan. Find a lounge chair out on the spacious deck and soak up the sun, play Badger Bingo, watch a movie, shop in the Badger Boatique, or enjoy a meal or drink. The trip will fly by, and you may not want to disembark! If traveling from Traverse City to Green Bay, the S.S. Badger is the way to go. Take a scenic drive of less than two hours from Traverse City to Ludington, which is the Michigan carferry port. 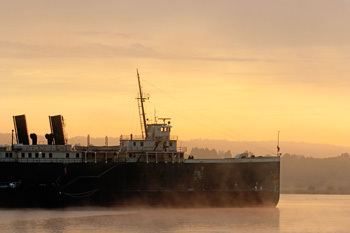 From Ludington, board the S.S. Badger (vehicle included) and enjoy a relaxing four hour cruise to Manitowoc, Wisconsin. Once in Manitowoc, you have less than an hour's drive to Green Bay. 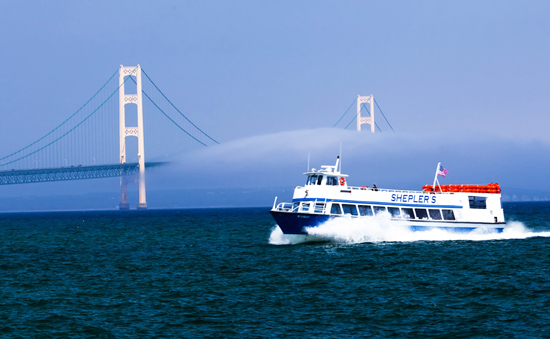 A ride on one of the ferries crossing from Mackinaw City or St. Ignace to Mackinac Island is an experience that thousands of people enjoy every year. Mackinac Island is a major tourist destination and the ferries are the way to get there. Three ferry businesses--Arnold Transit, Shepler's Mackinac Island Ferry, and Star Line Ferries--cross the Straits of Mackinac like clock work during the summer months. The 20-minute crossing takes visitors from the mainland to a setting where the horses are still king. Beaver Island, off the coast of Charlevoix, also is accessed by ferry. The Beaver Island Ferry transports visitors, cars, trucks, groceries, supplies and more to the island. The ferry leaves from Round Lake in Charlevoix and travels through the Pine River channel before heading across Lake Michigan to the emerald island. Enter the Ghost Ship...If You Dare! The highlight of the Halloween season has to be the popular Ghost Ship, otherwise known throughout the year as the S.S. City of Milwaukee, docked off Arthur Street in Manistee. Every Friday and Saturday in October, thousands visit the ship, which has been transformed into a ghoulish and frightening haunted house. Navigating the steep stairways deep into the ship is challenging enough--having people jump out of the darkness is definitely a scary and heart-stopping experience!